I thought it important to try something new today, but I had to push myself past the point of no return last night to make sure that something happened today. Before all the partying started, and in anticipation of the inevitable tenderness of this morning, I fished a Guinea fowl out of the freezer and let it defrost overnight. Last night was a good night, full of food, wine, laughter and happiness, and the temptation to just smear the by-now-defrosted guinea fowl in butter and chuck it in the oven was great, but I avoided that lazy option and spent an hour deboning it, stuffing and rolling it, tying the lot up into a reasonably neat parcel – a ballotine – ready for the oven. Guinea fowl isn’t particularly common, but a good butcher will be able to get hold of it, and it crops up in some supermarkets every now and again. Mine came from Callards on Leeds Kirkgate Market. Guinea fowl is a good alternative to chicken – it has a stronger, more game-like flavour, but it isn’t as strongly flavoured as pheasant. It roast well, so chucking one in the oven really isn’t such a bad idea, just make sure that some bacon or foil protects the breast, as it has a tendency to dry out quickly. Taking the bones out of a bird is a tricky operation, but it’s possible with some care and a slow approach. A small, sharp knife is invaluable. The same technique stands for any kind of bird or fowl. Start by removing the wings, then place the bird breast down on a chopping board and carefully carve away the meat at one side of the backbone, staying as close to the bone as possible, and trying to keep the skin intact. Work slowly, and study the anatomy of the bird to find the best cutting route. When you get to the legs, detach them from the body and continue to cut around and back down the other side of the rib cage. Once the carcass is free, work on the legs, honing the meat back from the bone so that you’re left with two pockets of meat where the leg bones were. The result is a flat, if somewhat ragged looking piece of meat. this doesn’t matter, because all that raggedness will be hidden inside the rolled joint. A rolled bird needs some stuffing, and I improvised today. A handful of breadcrumbs, five or six rashers of streaky bacon left over from Christmas and chopped in a food processor, a handful of raisins, another of pine nuts, some fresh thyme, salt and pepper. Dried apricots or prunes would work well, lemon or walnuts, too. 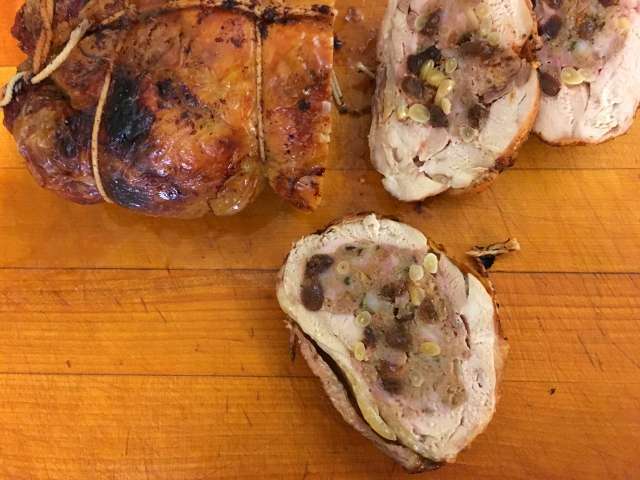 The idea is to make a stuffing that has a little crunch, some sweetness to counter the richness of the game bird, and a smack of salt. I purposely keep these quantities and combinations loose, because this must be something each cook makes their own. Aim to produce about a tennis ball sized amount of stuffing. Lay the de-boned fowl meat side up and season generously, then lay the stuffing across the middle third, in a rectangular shape. Push a little into the pockets where the legs were. Fold the sides of the meat over the top of the stuffing, and pull them together tightly but gently. 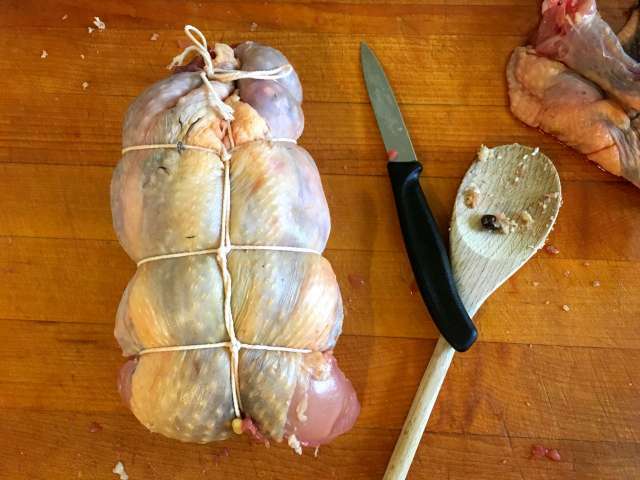 Use butcher’s’ string to tie the joint up – a second pair of hands is useful, but the basic principle is to tie the meat lengthways and across, so that it’s nicely trussed. I found that starting with a metre long piece of string, laid under the joint and then wrapped over the top, tied in a stop knot a few centimetres from one end and then wrapped across, under and back over, tying into the main, long string a few centimetres up from the first knot worked reasonably well. This is not how a butcher would do it, I’m certain of that. Roast in a hot, 200c oven for about an hour. A cook’s thermometer is useful for gauging ‘doneness’. North of 75c is essential, as is a good rest afterwards. Serve with roast potatoes, and steamed or boiled vegetables, something light and bright to balance the richness and sweetness of the meat. A simple, light gravy of stock made from the leftover bones would be very good. I love Guinea fowl, shall have to send the Mr out in his lunch hour to find one. This sounds like a wonderful way to cook it.